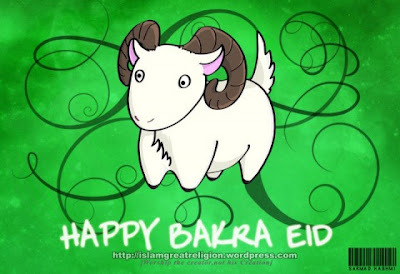 Eid-al-Adha also known as Eid-al-Zuha is one of the important festivals of the Muslims. Eid-al-Adha is celebrated on the 10th day of the 12th month, Dhu a-Hijjah. 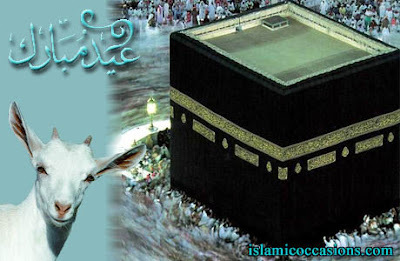 It occurs after the Hajj pilgrimage, which, is the fifth pillar of Islam, undertaken by the Muslims. According to the holy book Quran, the Bakri Id is a tribute paid to Abraham’s wish to sacrifice his only son Ishmael. Muslims are going to Animal Markets to buy Cows, Goats, Sheep and other animals for sacrificing on Eid that is done in memory of Prophet Ibrahim A.S Sacrifice on every Eid Al Adha. Shopping for Eid is also in full swing. People are buying new dresses and other items for the Eid. Females are preparing to make various delicious dishes with the meat of Animals. "O my Lord! Grant me a righteous (son)!" So We gave him the good news of a boy, possessing forbearance. And when (his son) was old enough to walk and work with him, (Abraham) said: O my dear son, I see in vision that I offer you in sacrifice: Now see what is your view!" (The son) said: "O my father! Do what you are commanded; if Allah wills, you will find me one practising patience and steadfastness!" So when they both submitted and he threw him down upon his forehead, We called out to him saying: O Ibraheem! You have indeed fulfilled the vision; surely thus do We reward those who do good. Most surely this was a manifest trial. And We ransomed him with a momentous sacrifice. And We perpetuated (praise) to him among the later generations. "Peace and salutation to Abraham!" Thus indeed do We reward those who do right. Surely he was one of Our believing servants. As a reward for this sacrifice, God then granted Abraham the good news of the birth of his second son, Is-haaq (Isaac): And We gave him the good news of Is-haaq, a prophet from among the righteous. Abraham had shown that his love for God superseded all others: that he would lay down his own life or the lives of those dearest to him in submission to God's command. Muslims commemorate this ultimate act of sacrifice every year during Eid al-Adha. While Eid al-Adha is always on the same day of the Islamic calendar, the date on the Gregorian calendar varies from year to year since the Islamic calendar is a lunar calendar and the Gregorian calendar is a solar calendar. The lunar calendar is approximately eleven days shorter than the solar calendar. Each year, Eid al-Adha (like other Islamic holidays) falls on one of two different Gregorian dates in different parts of the world, because the boundary of crescent visibility is different from the International Date Line. When my arms can’t reach people who are close to my heart. Mubarak ho tuje yeh EID-UL-AZHA. 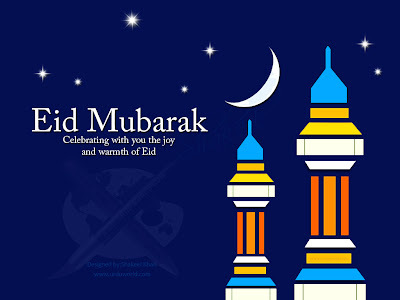 Eid Mubarak …. 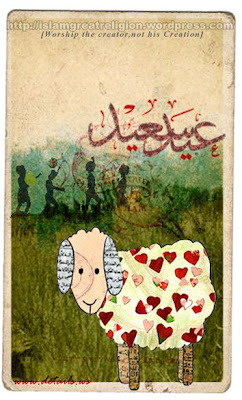 Sare Musalman ko Eid-al-Adha Mubarak Ho ..
Eid al-Adha (Arabic: عيد الأضحى‎ ‘Īd al-’Aḍḥá, IPA: [ʕiːd al ʔadˁˈħaː], "festival of sacrifice"), also called Feast of the Sacrifice, the Major Festival, the Greater Eid and Id-ul-Zuha, is an important 3-day religious holiday celebrated by Muslims worldwide to honor the willingness of ʾIbrāhīm (Abraham) to sacrifice his first son Ismā'īl (Ishmael) as an act of obedience to God, before God intervened to provide him with a ram to sacrifice instead. The Arabic term "Feast of the Sacrifice", ‘Eid ul-’Aḍḥā is borrowed into Indic languages such as Hindi, Urdu, Gujarati and Bengali and Austronesian languages such as Malay and Indonesian (the last often spelling it as Idul Adha or Iduladha). Another Arabic word for "sacrifice" is Qurbān (Arabic: قربان‎), which is borrowed into Dari Persian and Standard Persian as عید قربان Eyde Ghorbân, and Tajik Persian as Иди Қурбон (Idi Qurbon), into Kazakh as Құрбан айт (Qurban ayt), Uyghur as Qurban Heyit, and also into various Indic languages such as Bengali as রবানির ঈদ Korbanir Id. Other languages combined the Arabic word qurbān with local terms for "festival", as in Kurdish (Cejna Qurbanê), Pashto (د قربانۍ اختر da Qurbānəi Axtar), Chinese (古尔邦节 Gúěrbāng Jié), Malay and Indonesian (Hari Raya Korban, Qurbani), Filipino (Araw ng Pag-Sasakripisyo), Turkish (Kurban Bayramı), Turkmen (Gurban Baýramy), Azeri (Qurban Bayramı), Tatar (Qorban Bäyräme), Bosnian-Croatian-Serbian (Kurban bajram, Курбан бајрам), Macedonian (Курбан Бајрам), Albanian (Kurban Bajrami), and Russian (Курбан-байрам). Eid al-Kabir, "the Greater Eid" (the "Lesser Eid" being Eid al-Fitr), is used in Yemen, Syria, and North Africa (Morocco, Algeria, Tunisia, Libya, and Egypt). The term was borrowed directly into French as Aïd el-Kebir. Translations of "Big Eid" or "Greater Eid" are used in Pashto لوی اختر Loy Axtar, Kashmiri Baed Eid, Hindi and Urdu Baṛī Īd, Malayalam Bali Perunnal, and Tamil Peru Nāl. Another name refers to the fact that the holiday occurs after the culmination of the Hajj (حج), or pilgrimage to Mecca (Makka). Such names are used in Malay and Indonesian (Hari Raya Haji "Hajj celebration day", Lebaran Haji), and in Tamil Hajji Peru Nāl. 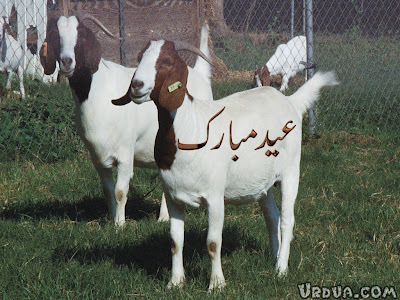 In Urdu- and Hindi-speaking areas, the festival is also called Bakr Īd, stemming from the Urdu-Hindi word بکری bakrī, "goat", because of the tradition of sacrificing a goat in South Asia. That term was also borrowed into other languages, such as Tamil Bakr Eid Peru Nāl. Other local names include 宰牲节 Zǎishēng Jié ("Slaughter-livestock Festival") in Mandarin Chinese, Tfaska Tamoqqart in the Berber language of Djerba, Tabaski or Tobaski in Niger–Congo languages, Babbar Sallah in Nigerian languages and ciida gawraca in Somali. Eid al-Adha has had other names outside the Muslim world. The name is often simply translated into the local language, such as English Feast of the Sacrifice, German Opferfest, Dutch Offerfeest, Romanian Sărbătoarea Sacrificiului and Hungarian Áldozati ünnep. In Spanish, it is known as the Fiesta del Cordero, the "Festival of the Lamb".